Looking for something to brighten your day? Then take a gander at this second video – a silly, delightful tale of a man and his kangaroo – from Justin Roberts’s latest album, Lemonade. Enjoy! It’s a Doo Da Day! Last week we had the great privilege of hosting Wendy & DB at our library. Back in August I reviewed their album It’s a Doo Da Day for School Library Journal. 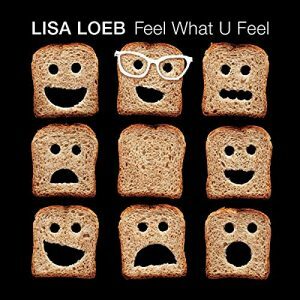 The album had great empowering messages about being yourself and owning your feelings while at the same time being a lot of fun. At the time, I thought it would be a perfect album for family or classroom listening but didn’t clearly see how to use it in storytime. Then, I saw Wendy & DB perform. Wow! That’s all I can say. Just wow! Their 45-minute performance was filled with such energy and excitement. Every song had an interactive component, most of which had the kids up and moving. The title track, “It’s a Doo Da Day” has a catchy chorus and wraps around the classic children’s tune, “You Are My Sunshine” making it the perfect way to start the show. 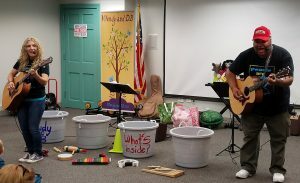 Once everyone was warmed up, it was full speed ahead with rocking songs like “I Love My Body” and “Pink Flamingo,” where each child was given a pink sock to use as a flamingo, then invited to act out all of the things that the flamingo does in the song. Things slowed down in the gentle “It’s Ok Being You,” which teaches children that if they are feeling blue or green or red, it’s ok. As each verse introduced a new color, the children were given scarves that color to dance with, creating a delightful rainbow of movement. 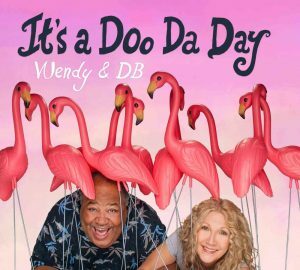 All of the songs on It’s a Doo Da Day are a joy to listen to. Wendy & DB are working on their next album, and I for one, can’t wait. Get more information about the duo, as well as listen to a couple of the songs off their album here. I’m the great-niece of men who served in WWII and Korea. The daughter and daughter-in-law of men who served in Vietnam. I’m the cousin to several who served around the world. I’m the co-worker to those who’ve had loved ones in Afghanistan, Iraq and Kuwait. I hold so much respect and admiration for our veterans and their families. I will never know or fully understand all that they go through so the least I can do is honor them. Which brings me to today, Veteran’s Day. Today, I’m happy to be able to salute a veteran who has taken a rough return to civilian life and healed through the unexpected power of creating children’s music. Derek McGee, one of the founders of the band Funkinships, served two tours in Iraq. After that much time living a high tension way of life, returning back home proved to be difficult. So Derek quit his Wall Street job and took a job that allowed him to live and work aboard the Mystic Whaler on the Hudson River, where he taught environmental education to children. It was during his time on the Mystic Whaler that he met musician Charlie Chamberlain and Funkinships was born. McGee has said of his introduction to creating music, “I had finally stumbled upon the thing missing from my life. I realized that much of the restlessness and angst I felt after returning home from war was a result of being a man without a band.” Well, Derek, I’m glad you found that band. Thank you for your service and for making music that kids will find comfort and joy in. It’s that time of year again. Time for the Best of… lists to start appearing. First up in the land of children’s music is the 11th annual Fids & Kamily Music Awards. Voted on by folks familiar with the fantastic offerings from the children’s music industry, this list of the Top 10 albums of 2016 is a list of “must haves” for every collection. Don’t forget to take a look at the Honorable mentions, they are great ones to have as well. Keep an eye out next month for School Library Journal‘s 10 Best Children’s Albums of the year. 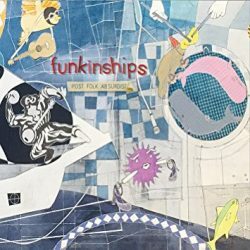 Are there any albums you wished had made the list?